Set up paid time off plans that can be tracked or accrued so employees can request time off easily and managers can approve it just as quickly. * Psst! You have to be a Wagepoint user to access the magic of Luna. Luna is a paid time off management app to help you stay organized. View and manage employee time-off requests and watch them appear in an easy-to-read calendar that everyone can see. And the best part? If you’re already using Wagepoint, there’s no extra employee data to enter - Luna has it all! 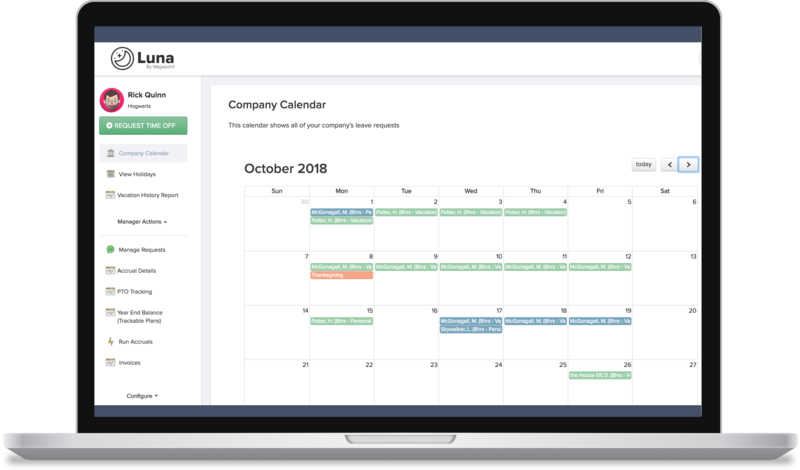 Luna makes it easy to create and customize paid time off plans. Choose between an accruable or trackable setup, enter your custom plan settings, and watch leave hours accrue. No more post-its to keep track of all those vacations, sick, and personal day requests. Employees can request time off from their Luna account and managers are notified so that they can approve or deny the request at their leisure. When an employee is set up in Wagepoint, they’re automatically added into Luna. All you have to do is create the plans, assign them to your employees and you are off to the races! Do I need a Wagepoint account to access Luna? Yes - Luna is an integration for current Wagepoint users so you can streamline your vacation time tracking process. Don’t have a Wagepoint account? Sign up here. How much does Luna cost? For 6 or less active Luna users, you pay a flat rate of $20 per month. For 7+ users, you pay $3 per user per month. You only pay for employees who have leave plans assigned in Luna. For example, your company has 10 employees on staff - seven are salaried with vacation plans and 3 are hourly. Only the 7 salaried employees have assigned vacation plans in Luna, so you’ll pay $3 per user for a total of $21 per month. Luna fees are debited from the bank account you have on file for Wagepoint. You’ll be charged at the start of each month, separately from your Wagepoint payroll fees. Employee records from Wagepoint are automatically added to Luna when you activate the integration. But the employee is only considered to be an active user when you assign a leave plan to them. How do I activate Luna in my Wagepoint account? Once you log into your Wagepoint account, click the “Add-Ons” options in the list under your avatar in the top right corner or your screen. Select the tab labeled “Luna” and then click the “Activate” button. Do all my employees have to use Luna if I sign up? No - you can choose to assign (or not assign) leave plans for any employee in your Wagepoint account. Whether you want to use Luna for one employee or 100, it’s all up to you. I don’t see my question listed! Never fear - our friendly sales team is always ready to help. Contact us today and we’ll help you get started.